Original Content: Didactic Fiction--Who Decided It's Bad? I am not a fan of didactic novels, books with an agenda to teach vs. books that require readers to, oh, I don't know. Become one with the story, or something. Experience the story. I've probably mentioned this bias of mine here before. But I've had to rethink the whole "didactic is bad" thing because of an essay I read at The Horn Book site. In The Campaign for Shiny Futures, Farah Mendlesohn has all kinds of fascinating things to say about YA science fiction. She describes Ender's Game as "the model of what child and teen SF readers want, yet it is not what they were getting (or still get) within the pages of YA science fiction." She also says that Ender's Game is a didactic book that prizes information over emotion. Kids, she believes, want didactic books. But there is a lot of opposition to didactic books from people like me. By the time I finished reading Mendlesohn's points about didactism, I had to ask myself, "What is so bad about didactic books?" 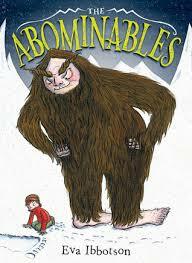 A case in point: The Abominables by Eva Ibbotson. It's one of those odd, English children's books filled with stock English characters, lots of them not very nice in an over-the-top way. A hundred years ago, a spunky, upper class girl is kidnapped by a widowed yeti who needs help raising his children in their isolated home. The yeti are intelligent, speak, and have very long lifespans, and even young Lady Agatha lives long enough to see their mountain home become developed. Development, of course, is bad for mystical creatures. To save them from hunters, she enlists the aid of a young boy who she charges with transporting her yeti family to her ancestral home in England, where she believes they will be safe. The yeti are innocent and good, large numbers of the humans they run into are not. The book is filled with humans who treat animals badly or hunt them down and kill them for sport. Children have to take things into their own hands. Though Prince Charles helps. I suspect this is one of the few works of fiction he's appeared in in anything approaching a positive way. There's some sly humor in this book, which explains Charles' very brief appearance. As Mendlesohn writes, The Abominables probably wasn't called didactic in reviews because it's didactic in a way most of us like. Trophy hunters aren't popular in our culture, and they weren't long before poor Cecil the Lion caught one's eye. But even if people like me do insist on calling The Abominables didactic, why is didactic a bad thing? If child readers like didactic books (I was fond of Louis May Alcott when I was a girl. I've got my doubts about her now. ), what's wrong with letting them have them? On the other hand, do we let children have everything they want? I'm at a loss on this one, folks. When I was a teenager, I read that "Propaganda doesn't serve literature." What is didactic literature but propaganda, even if it's propaganda we believe to be valuable, such as "Don't kill animals you can't eat." Hmm. But I got to read and enjoy didactic books before that point. ...as another 80's reader, I have to ask myself if I *really* liked the didactic nature of the books I was reading, or, if during that time, that was all that seemed safely available? I was being given a lot of what Mendlesohn calls "pious" material, and so I accepted it as normal -- because it was available, and it was thus normalized. Who's to say whether or not I would have liked something else? I apply what Mendlesohn points out about didacticism to dystopia - and its message of disempowerment/you can do nothing, it's all going to hell, pack that handbasket -- Where's the "what if" imagination in that?? In a way, the messages aren't ecology, etc., it's guilt and defenselessness, which I find hateful, but which also seems to explain the subplots which usually get hopelessly mired in relationship issues that don't propel the plot anywhere in particular. I still *want* to experience those stories -- desperately -- but I know all I'm going to get is relationships and not "what if." Rekindling that sense of wonder in what we DON'T know is what, I think, would revitalize MG/YA SF... by necessity didactic, in a way, as the writer tells us what we don't know, but experiential by necessity as well, as the story is written immersively. When I was very young, I read old kids' fiction--The Five Little Peppers, Rebecca of Sunnybrook Farm, etc. I suspect a great deal of that was pious/didactic and rolled right off my back. I was a teenager in the early years of YA. I didn't read much of it, jumping to adult fiction, classics and adult historical fiction. YA wasn't a big option for me. I wonder if didactic reading is developmental. Kids don't mind it, even like it, because at their stage of life, they need to be taking in a lot of information. It's pretty much what they do, anyway. They maintain the mind of a beginner, because they are beginners. When you're older, you don't need as much new information and may be pretty bonded to what you already have. You're not a fan of being told things. As you said, this is something to think about. My knee jerk reaction is that if The Horn Book opines about something, they are probably wrong. They seem to have so little interaction with actual children, but I haven't read this article and know nothing about the author of it, so I could be wrong in this instance. I loved Alcott, but it's a tough sell today. That sort of didactic style doesn't do well, but there is some gentle prodding that does well. Think Dairman's All Four Stars. What my students want most is something fun, with action and adventure. Something that takes them out of their own world and into someone else's. Karen, I knew of Farah Mendlesohn through the child_lit listserv many years ago. I know that she has written about fantasy in the past. Your issue about The Horn Book having little interaction with children is an interesting one. I don't know that that's actually the case, but, having been a faithful reader/subscriber for many years, I'd have to say that sometimes the articles are often about the children's publishing world--awards, profiles of librarians or editors. I'm two issues behind in my reading, and I'll be thinking about child connections when I start catching up.